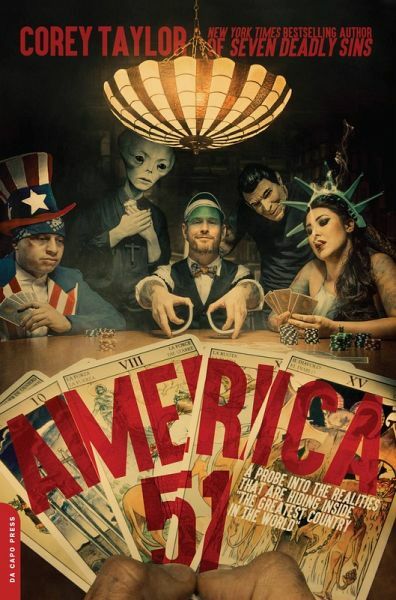 The always-outspoken hard rock vocalist Corey Taylor begins America 51 with a reflection on what his itinerant youth and frequent worldwide travels with his multiplatinum bands Slipknot and Stone Sour have taught him about what it means to be an American in an increasingly unstable world. He examines the way America sees itself, specifically with regard to the propaganda surrounding America's origins (like a heavy-metal Howard Zinn), while also celebrating the quirks and behavior that make a true-blue American. Taylor likewise takes a look at how the world views us, and his findings should come as a surprise to no one. But behind Taylor's ranting and raving is a thoughtful and intelligent consideration, and even a sadness, of what America is compared to what it could and should be. Expertly balancing humor, outrage, and disbelief, Taylor examines the rotting core of America, evaluating everything from politics and race relations to modern family dynamics, millennials, and "man buns." No element of what constitutes America is safe from his adept and scathing eye. Continuing the wave of moral outrage begun in You're Making Me Hate You, Taylor flawlessly skewers contemporary America in his own signature style.